Add Russia to the list of emerging market nations in turmoil. The ruble tumbled, sliding to the lowest level since November 2016, Russian CDS blew out and Russian stock and bond markets plunged after Russian Kommersant newspaper published the full text of the US bill which seeks to impose "crushing sanctions" on Moscow for election meddling. 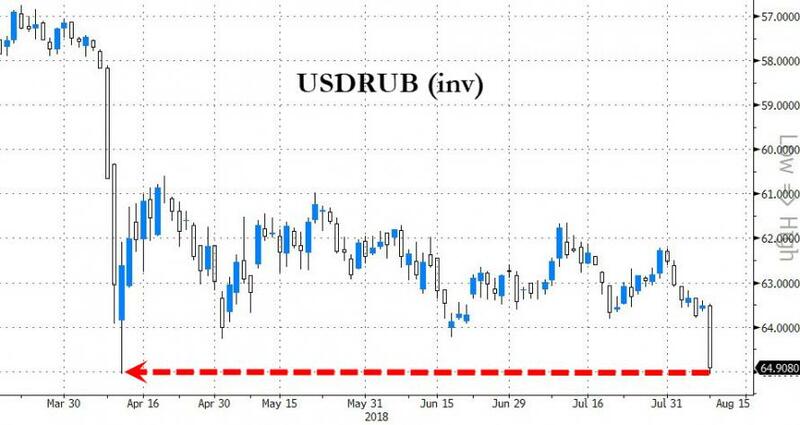 The ruble dropped more than 2%, sliding as low as 65 per dollar, and breaking out of a range it’s traded in since April, after traders had a chance to read the full text of the sanctions draft introduced last week by a bipartisan group of legislators. The liquidation panic set in after it was revealed that the bill includes proposals to sanction new sovereign debt and banking transactions, effectively a repeat of the US sanctions imposed on Russia in 2014 following the Ukraine coup, which sent the Ruble plunging from the mid-30s to below 70 in the span of a few months. "The Kommersant publication was the straw that broke the camel’s back," said Nordea Bank analyst Denis Davydov. “It’s important to be able to read and assess the actual bill." As Bloomberg notes, traders are particularly concerned by a clause that calls for prohibiting "all transactions in all property and interests in property" of some of the country’s largest lenders. The listed banks, Sberbank, VTB Bank, Gazprombank, Promsvyazbank, Rosselkhozbank and Vnesheconombank all saw their stocks tumble in response. The draft also includes Bank of Moscow, which was merged into VTB in 2016, while Vnesheconombank is listed twice in the text, without explanation. 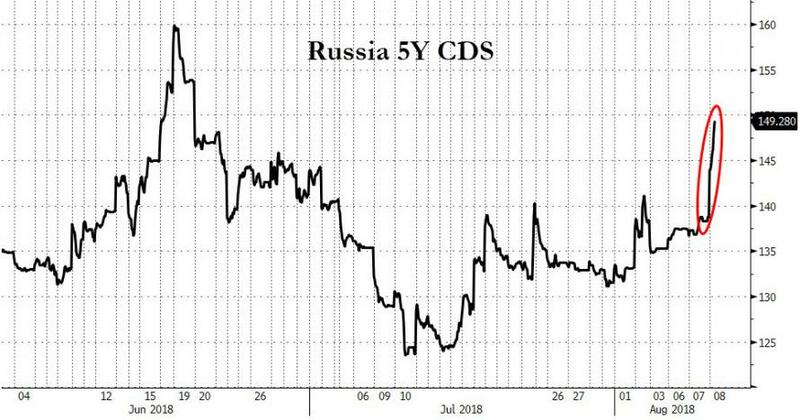 While the yield on Russian 10-year government bonds jumped 16bps to 8.04%, the highest level in more than a year, Russian CDS saw the biggest pain, blowing out from below 140bps to as high as 150bps in intraday trading, a two month high. Stocks were not spared either with the benchmark Russian stock index sliding 0.8%. For now, no immediate action will follow with Congress on summer recess in September, "leaving room for more market jitters through the end of the month." The silver lining: with President Trump calling for closer ties with Russia, and the U.S. Treasury warning earlier this year against sanctioning the sovereign debt market, Bloomberg's Benjamin Dow notes that "a lot of stars will have to align for these scenarios to play out and actually lead to sanctions -- and this reality can give Russian assets relief once traders get beyond the knee-jerk fear."